Up, Up, Down, Down, Left, Right, Left, Right, B, A, (Select), Start. It didn’t start here, but this is what made the Konami code so famous. It’s amazing how much people are vying these days for local multiplayer cooperative games. Donkey Kong is returning with co-op, New Super Mario Brothers Wii gets you up to four at once…though two of them are just generic Toads. With so many Mario characters available, they really choose two dolts with a simple pallete swap? Ragggge!!! But I digress…. OK, well, if you’re looking for some simple cooperative action without a wuss bubble that lets you skip ahead to the front of the level, then why not jump back in the fight against Red Falcon with the Contra brothers? “Hey Mark, these two guys look exactly the same, only one has blue pants, and the other has red!” Well, that may be, but take a keen look at the cover art and title screen. That’s right, you get to pick up your infinite ammo rifle as Stallone and Schwarzenegger! Well, not really, but as with most NES games, you have to use your imagination. At least you don’t have to be a kindergarten cop, “get to da choppah,” or beat up a hulking Soviet. There’s so many bad side-scrolling shooter games out there, most of which came after Contra. There are two types of weapons in Contra: the Spreader Rifle, and “Other.” The Spreader Rifle, or simply, The Spreader, gives you 45 degrees of win. It works even better in cooperative when your buddy takes point, and the guy with the spreader rifle hangs back and lets it spread out over the area ahead. 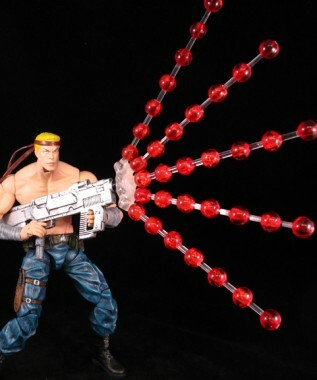 Contra lets you shoot in all eight directions, even while jumping, and you’re going to need it because there’s stuff all over the damn place. No one knows what planet Red Falcon (my guess is, “Red Falcon”) came from, but they sure did a good job at hiring every human and every piece of tech to kill you. So do you want to have blue pants, or red pants? Here’s a little trivia, if you combine (overlap) red pants and blue pants, you get flashing purple pants, the very pants that your character wears when he has the Red Falcon Invincibility power up. It’s just the magic you would expect when you cross Schwarzenegger and Stallone, and if you haven’t seen The Expendables yet, I highly recommend it. This game is also available on XBLA, but it’s not the NES version we’ve come to love; rather, it’s the original arcade version. That is a wonderful first picture. Well done. Alas, I did not create the picture. It’s origin is here. I did, however, dream the dream. I always hated the one guy who could run ahead of the action; my friend would always run ahead and kill me a bunch of times during the Waterfall level.